FIFA 19's were halted last month. 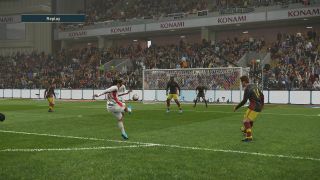 "We fully respect the BGC's interpretation of relevant laws and made the decision to implement local changes to "PES 2019" in Belgium," said Konami in its statement. Konami is the latest publisher to take action following the Belgian Gaming Commission's report referring to Loot Boxes in games as a form of gambling. CS:GO disabled loot boxes last summer and Blizzard pulled paid loot boxes from Overwatch and Heroes of the Storm shortly after. More recently, EA withdrew FIFA Points sales in Belgium at the end of last month. It doesn't appear that any direct action was taken by the BGC against Konami at this point. However, last year's investigation into EA—which appears to have led to the recent removal of FIFA 19's currency sales—may have prompted the decision.